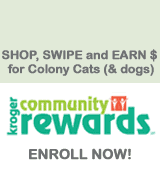 Be sure to "like" us on Facebook to keep informed about the latest Colony Cats happenings – including fun events, fundraisers, and what we (and the cats & dogs) are up to. Join Colony Cats this Saturday, April 6, at the Petco Lennox Center location for a "special" adoption event – it's our "Underdog" Cat Adoption Bootcamp. Sometimes overlooked, these special "underdog" kitties deserve loving forever homes too, so we're having a special adoption event just for them. 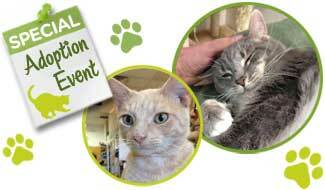 Come to Petco at Lennox Center and meet some of our FIV+ cats as well as some perfectly imperfect cats and kittens. Who knows you may just find your furever friend! Held the 1st Saturday of every month. Thinking about adding a furry friend to your family? Visit adoptable cats daily during the store's open hours. • Adoption Event: 2nd Saturday of every month from 12 noon – 2pm. • Adoption Event: 2nd Sunday of every month from 1pm – 4pm. 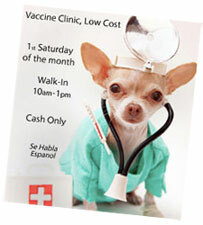 • Adoption Event: 1st Saturday of every month from 1pm – 3pm. • Adoption Events: 1st Saturday and 3rd Sunday of every month from 2pm – 4pm. • Adoption Event: Every Saturday from 1pm – 4pm. Meet some of our adoptable dogs at this twice-monthly adoption event at the Dog Shelter. 1st and 3rd Sundays of every month from 12 noon – 2pm.